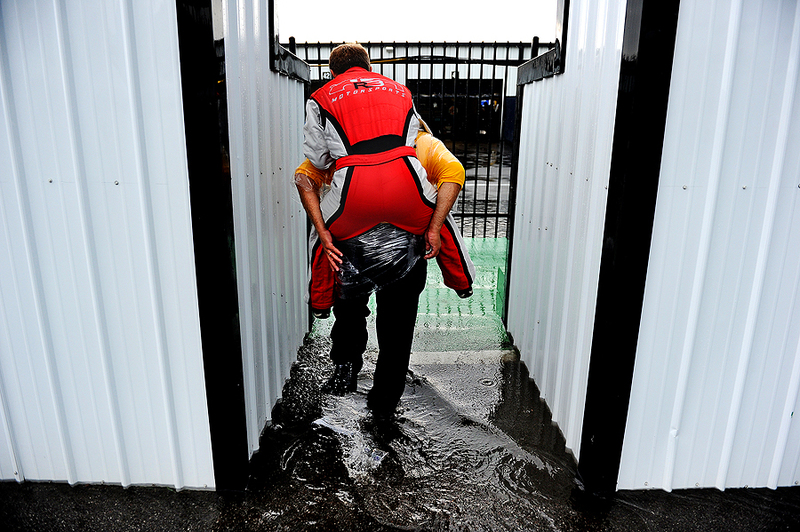 "Scott Riggs, driver of the #23 North Texas Pipe Chevrolet, is carried over a puddle by a security guard as rain delays the start of the NASCAR Sprint Cup Series Pennsylvania 400 at Pocono Raceway on August 5, 2012 in Long Pond, Pennsylvania." Minutes before the start of the NASCAR Sprint Cup Series Pennsylvania 400, and after getting caught on the grid in torrential downpour, the rain lightened up just enough to try and make my run back to the media room. Without a rain coat, I threw my long glass under my shirt and sprinted. But the journey was a solid five minutes back to the media lounge. Much like when you are running across hot sand on the beach looking for relief in the tiniest bit of shade, I tried to find every overhang to shield myself from the rain on the run back. About halfway back, I was underneath the corner of the victory lane building when I saw drivers running back to the garage. They had found the same covering as me in attempt to stay dry. 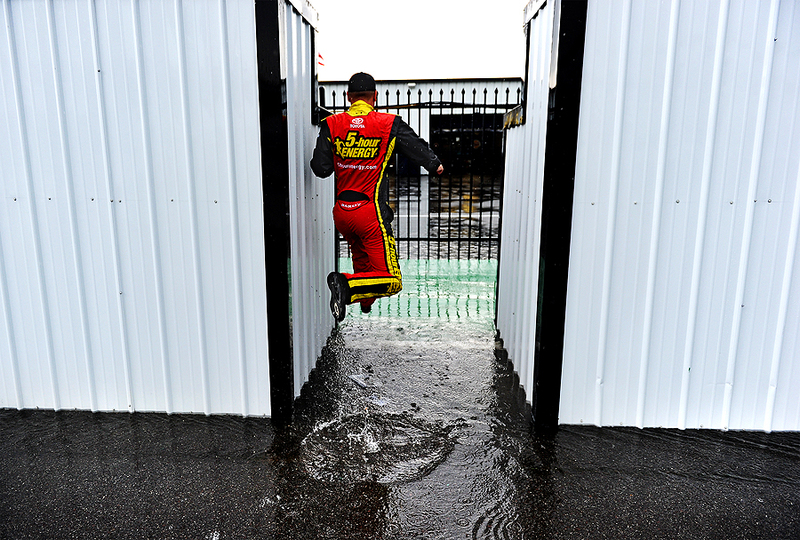 Multiple drivers were running back to the garage, but deep puddles tested everything but their driving skills. Most walked around as they had umbrellas, but a hand full jumped over the puddles. Much like Clint Bowyer, driver of the #15 5-hour Energy Toyota. After shooting the picture of Bowyer, I knew it was a nice candid moment and feature, so I started heading back once again. But out of the corner of my eye, I saw Scott Riggs, driver of the #23 North Texas Pipe Chevrolet, jumping on the back of a security guard at another opening toward the garage - the guard was risking getting wet for the driver. A loud echo of cheers sounded from the victory lane building in honor of the guard afterward - fans, drivers and onlooking had been watching the small heroic effort. Certainly a moment funny moment that was worth getting wet for. It's slices of life, behind the scenes moments, like these that make everyday sporting events a lot of fun to cover beyond the high-speed action.